The tangerine tree is the latest addition to our garden. In just a few years, the young tree has matured into an adult tree with fully developed branches and evergreen leaves. We are currently enjoying our biggest harvest yet with over 50 tangerine fruits collected so far. This is important because tangerine is one of the lucky fruits of the Lunar New Year. The fruit symbolizes closeness and family. Previously, we purchased tangerines from local markets for festive display and consumption. This year, we could use our own and may also share them with friends and acquaintances. Like most citrus fruits, tangerines are sourly tasted when they are not fully ripe. 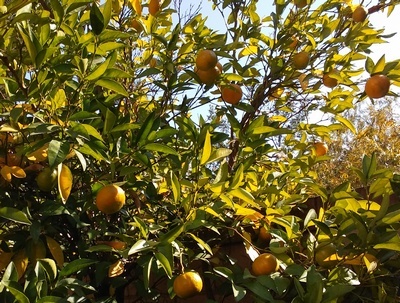 When they are ripe (outer skin color is full orange), they taste sweeter than common oranges. Tangerines are known as a rich source of Vitamin C, which aids many key parts of the human body including bones and heart.